A straightforward way to master a complex subject! 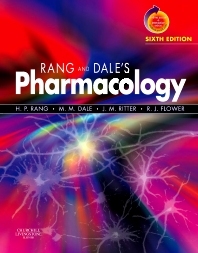 This bestselling textbook presents all the knowledge you need to get through your pharmacology course and beyond—using a clear and accessible approach that makes the material easy and interesting to learn. Progressing logically from a molecular understanding of receptors and drug actions to the clinical uses of the most important groups of drugs, it delivers the latest information on cannabinoids and rimonabant, Cox 2 inhibitors, pharmacogenetics, biopharmaceuticals, and drug abuse—as well as "lifestyle drugs" such as performance-enhancing substances, botulinum toxin, and Viagra®. And now, online access via STUDENT CONSULT makes it an even more effective learning resource! Discusses "lifestyle drugs" such as performance-enhancing substances, botulinum toxin, and Viagra®.